Special Delivery- Brutus Monroe February Inspiration Box + BLOG HOP! Welcome, crafty friends! Today I have the pleasure of hopping along with the Inspiration Team as we share our creations from the latest SUBSCRIPTION ITEMS from Brutus Monroe! 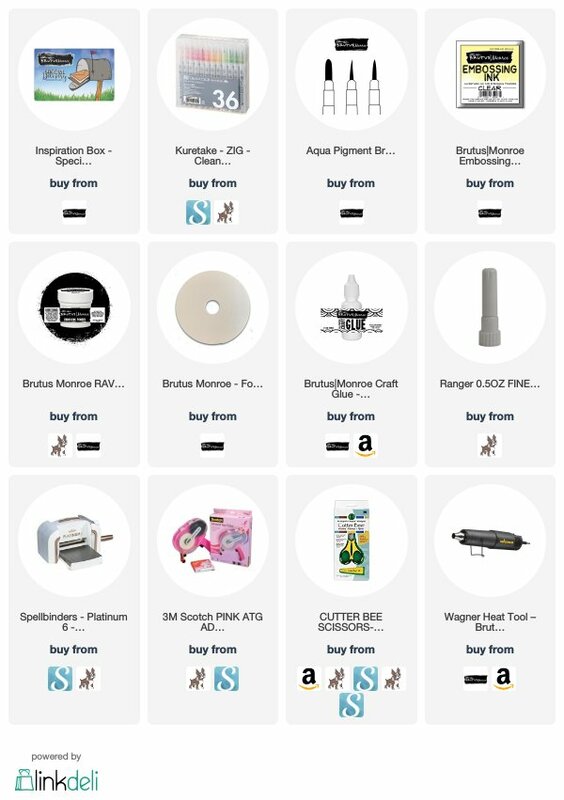 You may already know that Brutus Monroe offers subscriptions to their Stamp Club, Embossing Powder Club, Stencil Club, and more! Today, Im sharing a card I created using their stamp set from the latest INSPIRATION BOX. This box is full of thing related to happy mail, snail mail, and special deliveries! We all love getting happy mail, right? I know I do! The stamp set in this box is full of mail images, mailboxes, and a few fun sentiments. I started this card by cutting a piece of watercolor paper down to fit a size 10 card. This is a long and skinny card, and I love this size for creating scenes! I used the three mailboxes in the stamp set and stamped them on my watercolor paper, embossing them in RAVEN EMBOSSING POWDER. After the mailboxes were embossed, I also stamped and embossed the sentiment in the same powder. I then grabbed my ZIG BRUSH MARKERS to add the color. Since these markers are so brightly pigmented, I added only a little color to where I wanted the darkest part of my image to be. Then, I used a WATER BRUSH to spread the color onto the whole image. All my coloring here is done with these Zigs! I also added just a touch of blue to the bottom of the card. I wanted to make a very light background just to ground the mailboxes some, but not take away from the images themselves. I also added that cute little bird to the lefthand mailbox. The bird is from the Halloween stamp set and is meant to be a raven, but I colored him blue to match the scene! I then used my FOAM TAPE to mount the scene onto a size 10 kraft card base. I added a little strip of black and white washi tape behind the scene, with just a little peeking out. I think this adds a little something fun and special to the card! I also added a few die cut hearts to the one empty mailbox, and next to the sentiment. I thought the hearts were so cute and went well with the sentiment! I colored these hearts with the same red that I used to color the flags on the mailboxes, so that they would perfectly coordinate. Thats it for the card today! Thanks for stopping by. Please continue on hopping to the rest of the team’s blogs to see what fabulous creations they have come up with, as well! Happy hopping! Next Post Share Handmade Kindess- Sparkle Three Ways! I thought the bird was a cute addition too! Thanks!